Sal: A human of Whitehall. One of Denzig's shadier contacts. Denzig often sells gold to Sal for cash in the back alley of the theater, as legitimate enterprises tend to ask too many questions. Satyr: (SAY ter, in US English, or SAH ter, in British) In Greek mythology they were represented as a part man, part horse, with the upper body of a man and ears, legs, and tails of a horse. Many depictions portray them with human legs rather than horse legs. In Roman mythology this was often changed to a goat instead of horse, and horns were added, perhaps used interchangeably with the Latin fauns. Satyrs in Elf Mastery have the features of a goat, including the legs and feet, and the ipotane is used to represent the half-man, half-horse. Satyrs love to carouse with nymphs, and have a reputation for being rude and bawdy, though many of the world's finest vintners are satyrs. Saul: A satyr who takes an immediate shine to Eunoe, and is quickly rebuffed. However, he develops a fondness for Kyla and her friends and works himself into their plans when he is able. While Saul is an extrovert and self-professed lover of women, he is less aggressive and rude than many of his kind, though his manners still suffer from a lack of proper social education. He has a brilliant mind and is a quick study, picking up talents with little practice and causing Kyla some jealousy. He is an Engineering student at Equinox. Shadow Travel: One of the abilities Erebus may grant to his followers, Shadow Travel is the ability to travel quickly through darkness. During this phase of travel, the travel becomes shadow, and can travel through even the smallest pieces of darkness. If the light becomes too great, however, they must materialize and travel normally. Solsimir: (SOL sim ear) A satyr from Rava Glen. Sophrosyne: (sof ROSS in ee) A mysterious woman in black who carries the scent of moonflowers. Soul Weaving: The ability to connect (or disconnect) souls from their bodies. A very difficult technique to master, as the soul weaver must be able to intuit the properties of the souls she wishes to tie. Eunoste of Arkwood is a master soul weaver, and used this technique to attach Aspen to Eunoe. Sprite: A mythical creature often used interchangeably with fairies or elves. Sometimes attached to an element, such as an air sprite or water sprite. 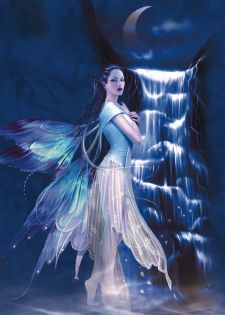 In Elf Mastery they are similar to fairies and pixies and exist in types for each element (water sprites, air sprites, etc). Whereas pixies and fairies in Elf Mastery have a history of conflict, sprites have led a comfortable existence with both and may act as moderators between the two should tensions arise. Steed of Light: Large white horses with constantly flowing manes which can travel at great speeds. Their primary purpose is to pull the chariots that scatter light throughout the solar system so living creatures can see. Sticks and Stones: A game somewhat similar to bocci ball, in which nocked sticks and round stones are tossed onto a field. Each player has a one-stick, two-stick, and three-stick, and matching stones. Stones are used to score points, and sticks are used to take away points from opponents. A favorite past-time of Aspen and Eunoe. Sulafat Station: (SOO la fat) The star known to us as Gamma Lyrae, also Sulafat or Jugum. The name Sulafat is derived from the Arabic word for 'turtle', hence the motif in the story. In Elf Mastery, the stars are actually lighthouses floating on rocks near the Oort cloud, where guards watch for signs of Chaos and his followers. The beacons not only provide some light but also have enchantments and alarms to keep Chaos and his followers from crossing the barrier. Sulafat Station is the post of Dunkin and Linkin.